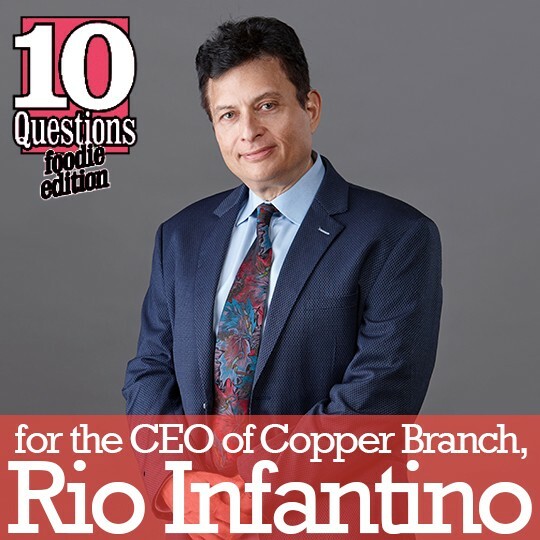 Rio Infantino is the CEO of Montreal-based fast-casual Copper Branch, the world’s largest 100% plant-based restaurant chain that is opening its 50th location this year by Earth Day (April 22) in the Greenwich Village neighborhood of Manhattan. With locations throughout Canada as well as in France, the NYC location will be their second U.S. after their recent Ft. Lauderdale, FL launch. Working with the Rainforest Trust, Copper Branch is committed to building a more sustainable planet, having already saved more than 1,000 acres of rainforest land through their partnership. Rio’s goal is to have 200 Copper Branch locations opened by 2020, focusing on the U.S. and Western Europe, where everyone can enjoy their organic power bowls, burgers and sandwiches that are all 100% plant-based. (Just skim the plant-forward menu and try not to drool.) I am happy to feature Rio Infantino as this week’s Vegan Foodie. 1. How did you start down this path of creating delicious food? Was a love for food nurtured into you? Did you have any special relatives or mentors who helped to instill this passion? Copper Branch was founded on the idea that food should empower our bodies and our lives. For many years, I had a very strong idea of how food should be sourced and served and saw that the destruction to our planet through factory farming and environmental degradation needed to be stopped…and what better way than through food. I have over 30 years combined experience in the restaurant industry. My true franchise experience began with Subway restaurants in which I was a multi-unit franchise owner for over 20 years, owning as many as 15 locations at one time. Throughout my career, my health and lifestyle were severely negatively impacted. Weighing up to over 350 pounds and in physical despair, my health was a major concern. After several years of feeling stressed, overweight and out of shape, I finally decided my life needed to change. From that moment on, I made a commitment to bettering my health and was fed up of serving food that I was not proud of and that had no true nutritional value. Today, I feel incredible and in-shape and I am of course a strong advocate for a plant-based, whole foods diet. And so finally, with my new-found health and intense years of operational training, I started to work on the project that was Copper Branch. Copper Branch took several years to fully develop before opening the first location. I would work tirelessly establishing my contacts, working out my marketing and concept plan, and of course, working with many different chefs to establish a 100% plant-based menu that was not only delicious, but that had the capability of expanding to many locations and be served fast! Years went into tmy development until I was finally confident in opening the first Copper Branch location -that opened September 2014 in Montreal, Quebec. Ever since then, Copper Branch has been on a mission: to inspire and educate communities with our 100% Plant-Based, Power Food menu. To nourish and bring joy to our community and respond to many people’s demand for actual healthy foods in the fast-food market. Our goal is to branch across the globe, touching upon as many different communities as we can and inspiring the Food Revolution. We are proud to be part of the movement and want to continually be a game changer and inspire our customers with new and great tasting menu items. 2. What was your diet like when you were growing up? Did you have any favorite meals or meal traditions? Do you carry them over today? Growing up, I was mostly brought up on Italian foods and home-cooked meals. But I quickly fell in love with many different types of cuisine including Asian, European, and North American. I have a vast culinary background and a true passion for foods, all elements that I have tried to incorporate into the Copper Branch menu, of course, working alongside many other chefs and experts as well. 3. It’s late at night and you just got home: What is your favorite quick and simple vegan meal? Power Bowls! A mix of any of the fresh plant-based ingredients available, usually tomatoes, spinach, quinoa, cucumber, peppers, beans, chickpeas, seeds, etc! 4. If you could prepare one meal or dessert for anyone living or dead, who would it be for and what would you create? Steve Jobs is one of my true inspiration, it would have been an honour to serve him an incredible plant-based meal. 5. What do you think are common mistakes in vegan cooking and how do you avoid them? I believe vegan cuisine often lacks essential flavours, sauces, and of course, the traditional flavours that are found in many of the great options we have around the globe. 6. What ingredients are you especially excited about at the moment? Also, what ingredients do you always like to have on hand? Cauliflower, mushrooms, and different vegan milks like almond and oat are very exciting. The development in vegan “meats” is also very exciting! 7. What are your top three cuisines from around the world? I would have to say Italian (just because of my traditional roots! ), Indian cuisine (certain dishes on the Copper Branch menu were actually inspired by Indian cuisine), and general or classic American flavours. 8. Who or what has been most influential to you on your vegan path? Individuals, groups, books, films, etc. included. I have had the pleasure to work amongst some incredible chefs that have help guide me throughout this journey. Additionally, seeing incredible athletes, nutritionists and influencers like Rich Roll, Dr. Michael Gregor, Angela Liddon and many others have been incredible to watch and learn from as well. 9. What issue is nearest and dearest to your heart that you would like people to know more about? The degradation of our rainforests is an issue that is truly at heart and one of the founding reasons we have been pushing Copper Branch. Around the globe, our rainforests and precious land is being torn down for mass production and farming. That is why Copper Branch has partnered with Rainforest Trust, an incredible organization based in Washington, DC working with local governments to purchase actual land trusts that are protected, preserving millions of acres and animals around the globe. Not only will promoting more of a vegan diet help the environment and our planet in general, but working with incredible organizations that are protecting our rainforests, oceans, and planting trees is incredible as well. … the future for the benefit of ourselves and our planet!